We offer fast, efficient delivery of aggregates to your project site in Collingwood. 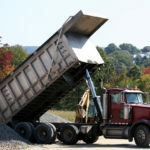 Stone – Whether you are looking for crushed stone for a paving project or limestone for landscaping, you’ll find the supplies you need with us at Flesherton Concrete Products. Gravel – We also offer a number of gravel choices, including A gravel, B gravel and crushed gravel, that work well for any number of applications. Sand – We carry excellent sand supplies, including filter sand, mason sand, and playground sand, which will make it easier to mix, pour and complete your project. Limestone- Limestone works well as an aggregate and a component of concrete. It’s benefits include great strength, durability, and reduced drying shrinkage. Recycled Concrete –When you are repaving, have an ongoing construction project, or require durable aggregate products, our recycled concrete is an excellent option to use as a road base. At Flesherton Concrete Products, we have been providing aggregates and concrete supplies to our customers for over 30 years. We can even deliver your supplies straight to your project site via dump trucks, stone slingers, dump trailers, live bottoms, and hoppers. We are a family-owned company that is focused on providing our customers with the best possible aggregates and the services to match. Contact us today to discuss your needs and schedule aggregate delivery to your project site in the Collingwood area. We look forward to serving you.